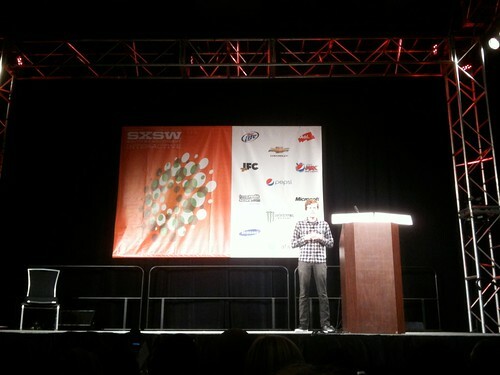 Here are the slides from my presentation for the 2011 eCoast Mobile Summit on mobile for retail. Get the slides here download[zip]. 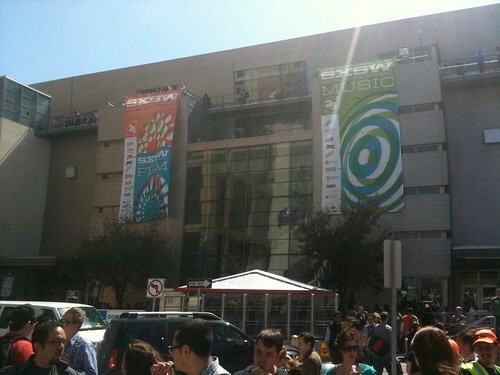 I just got back from SXSW Interactive 2011. What an amazing experience. I learned so many new things, met tons of awesome people and had a great time. Here’s my experience there, as told through my iPhone camera and iPhone screenshots, enjoy! 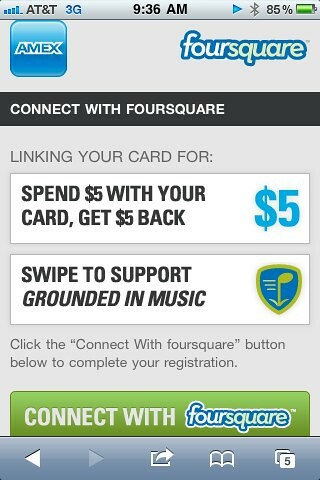 News broke of this deal with American Express as I was on the way to the airport in the C&J bus. Pretty cool! This is the rental they handed me on the ground in San Antonio (had to book a last minute earlier flight due to scheduling of my Foursquare Day kickoff event on Friday). 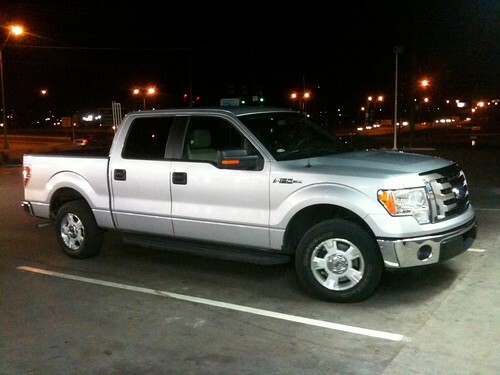 It wasn’t bad to have this to cruise around Austin with for a night. Here you could play foursquare with foursquare (and win a tshirt) – a huge leap up from what they had last year and by far my favorite place to go and relax in between sessions. 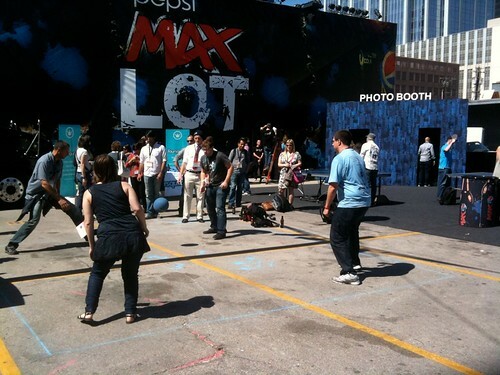 Free Pepsi MAX and hanging out with the foursquare team? YES PLEASE! These are the cards that Infinite Imaging donated to Foursquare Day – we put them out on the foursquare swag table next to the foursquare court and I stopped by every day to make sure there was always plenty on hand. 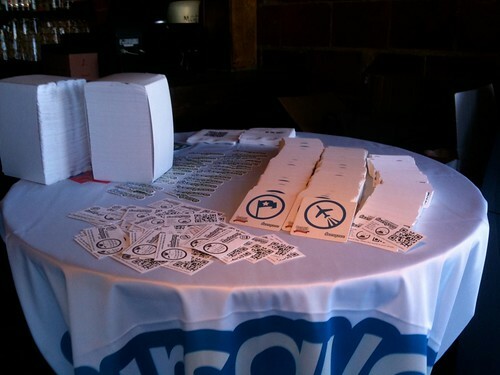 This was the swag table at the Foursquare Day kickoff event I organized – we also gave out foursquare tshirts for playing foursquare just like foursquare did at their foursquare court (phew, that’s alot of foursquares!). If you made it up to the fourth square (the mayor square) you got a foursquare tshirt. 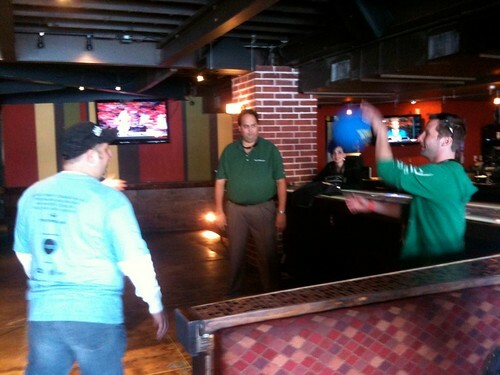 Included in this picture: Antony Francis and Alan Danzis (I think) playing foursquare while Miss Destructo looks on. 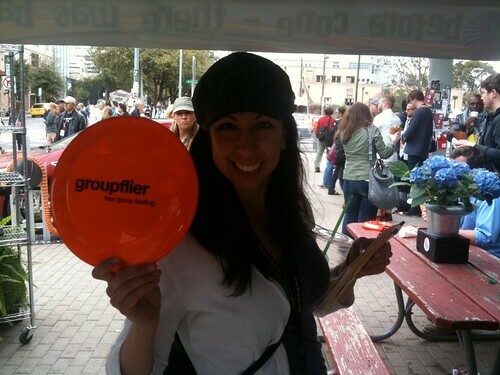 I got to meet almost the entire foursquare team in Austin (and they rock!). 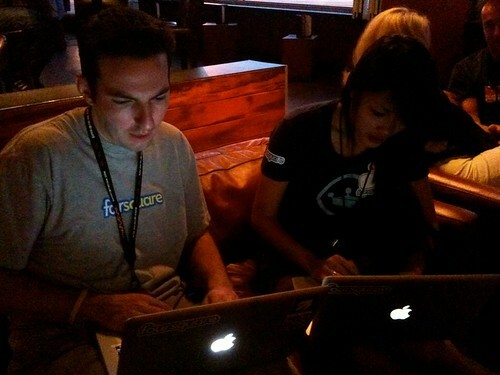 Here foursquare’s Nina Yiamsamatha and I bust out our laptops and do some superuser editing to fix some urgent issues with SXSW panel venues. 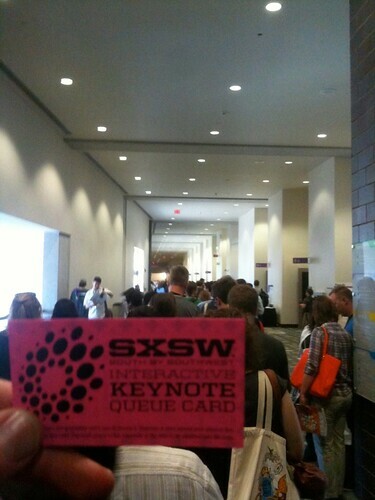 This year the keynotes were on the 4th floor, and to help keep the lines organized they gave out cards to ensure people who stood in line got in. 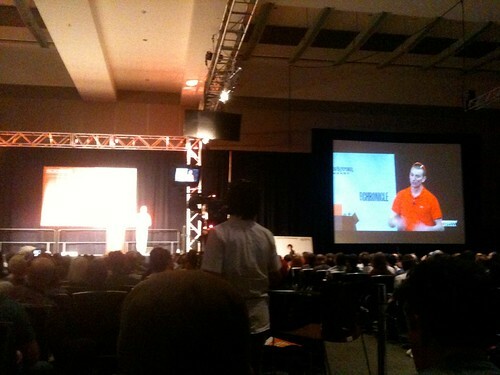 Sitting next to me at the keynote was John Bejarano from the StartupBus and his Isitgood4.me startup. 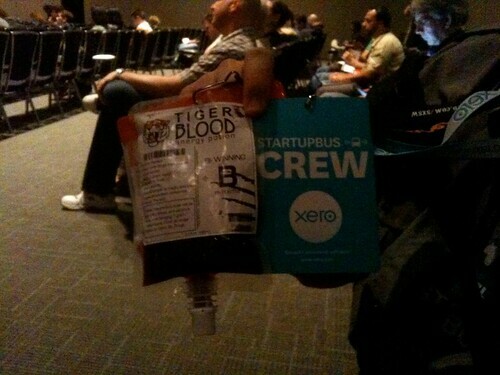 He showed off his secret to surviving SXSW: Tiger Blood. 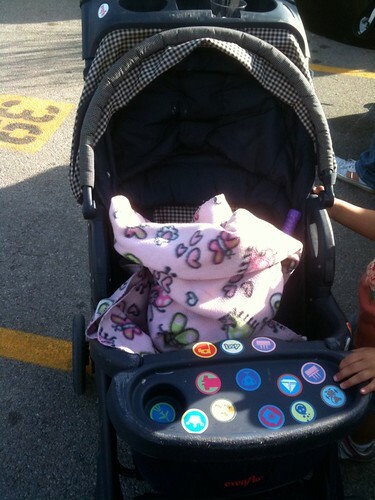 Spotted a mom and her little girl putting foursquare stickers on their stroller at the foursquare court at SXSW. So cool! Enjoying some BBQ at Iron Works (THE BEST!) 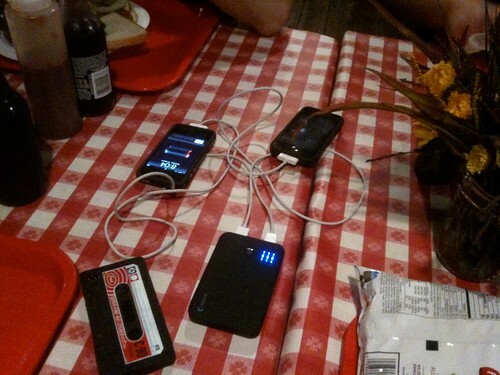 and letting my table-mates charge their iPhones on my Splash Intense battery pack. It’s got more than enough juice to go around! 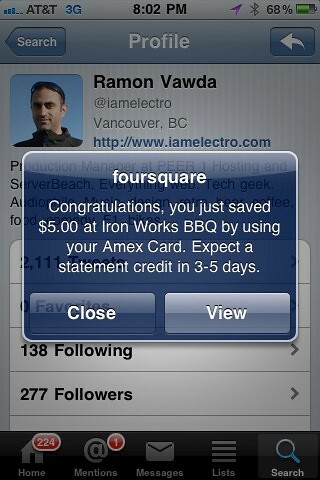 Because I checked in on foursquare and used my American Express I got a $5 rebate on my Iron Works purchase. Yeah, I can’t think of anything cooler either! 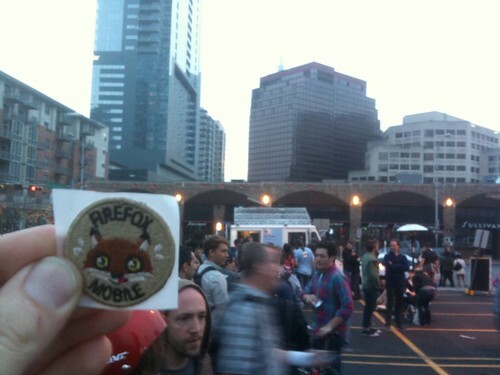 In background: SXSW veteran Ramon Vawda’s twitter profile, whom I randomly met in line at Iron Works and got to have BBQ with. 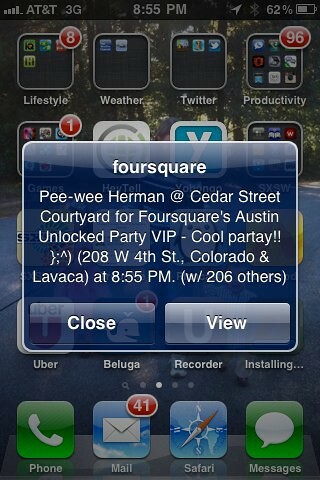 This was the scene at the foursquare party at the Cedar Street Courtyard. It had lines going around the block *on both sides of the building*. Wasn’t surprised to see this pop-up on my phone. I didn’t see him though. 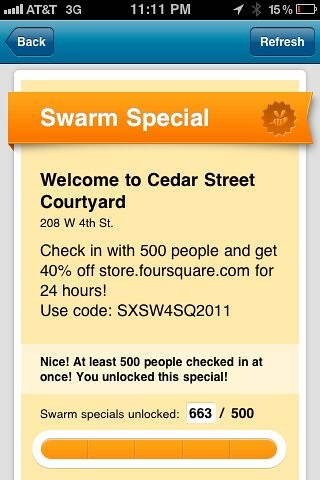 They had a special at the foursquare party that unlocked if 500 or more people checked in. That wasn’t a problem! Is it live or is it Android? 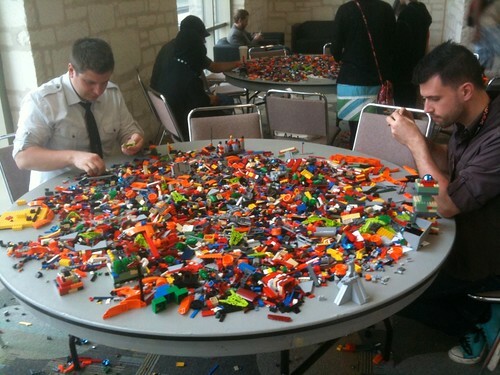 Legos, everywhere. Not sure what’s going on here, but they were thinking hard about what they were doing. The CEO of Placecast gave us a download on the latest location-based tools for mobile marketing. 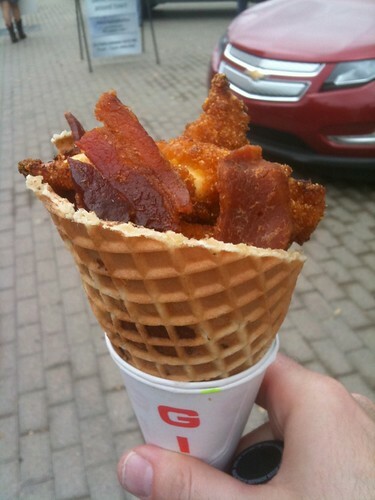 One of my favorite parts of SXSW is the bacon cones. Yes, you read that right- cones made out of bacon. This one has chicken cooked in bacon, breaded with captain crunch with some strips of bacon thrown in for good measure. 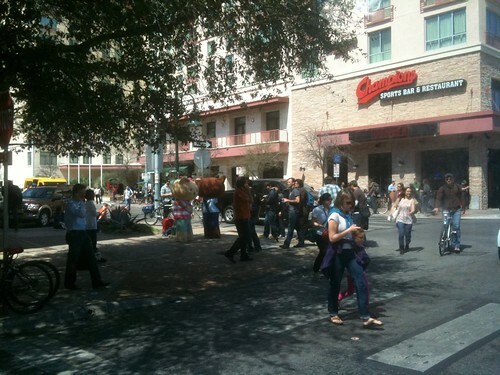 Here’s a picture of how Bacon Cone at SXSW10 looked. Seems consistently awesome! Due to a mixup my Splash Intense was not charged for one night and it died. Fortunately I had my TRANS4M AC / DC USB Charger as a backup. 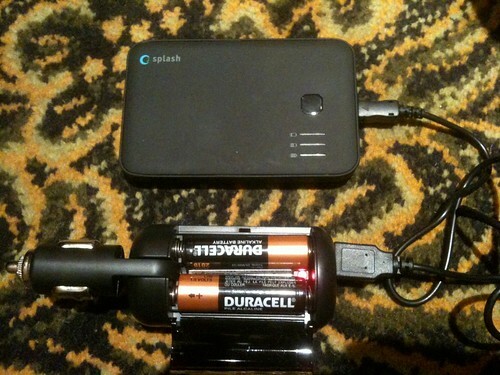 You can throw any power you want on it and it’ll charge USB devices. It takes AC, Cigarette Lighter DC, 9 volt and AA batteries. 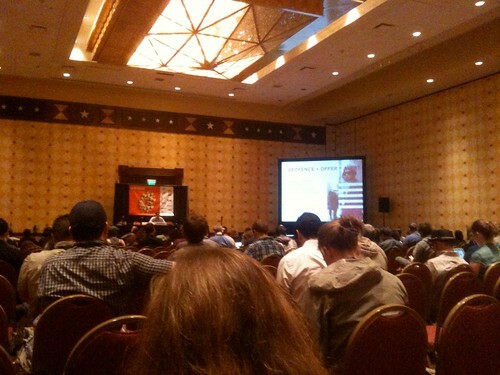 This was the room to be at at SXSW if you were into mobile. 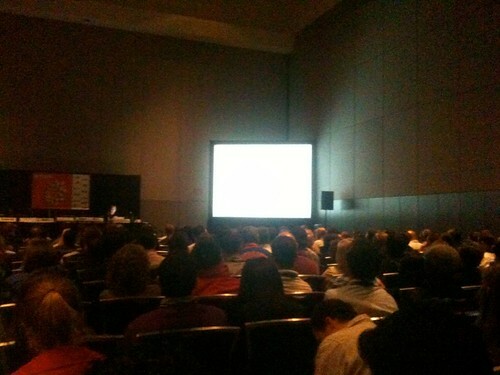 Back to back to back panels on mobile web, apps, design, development, strategy, platforms, NFC, what’s next- you name it. 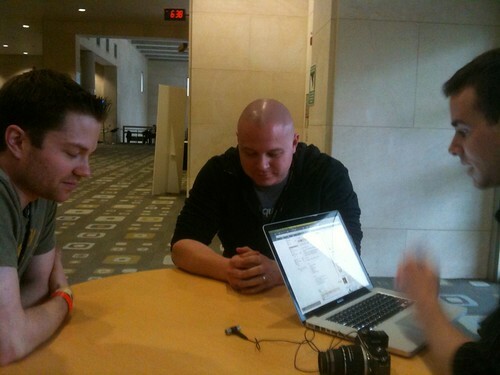 Had the opportunity to guest host the Aboutfoursquare.com podcast at SXSW. 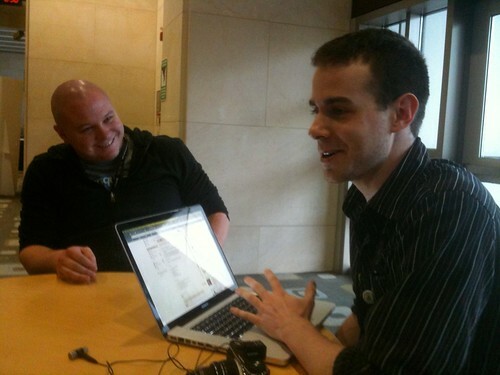 Here’s Eric and Chris during the recording, talking about, what else, foursquare. You can listen to the podcast we recorded here. 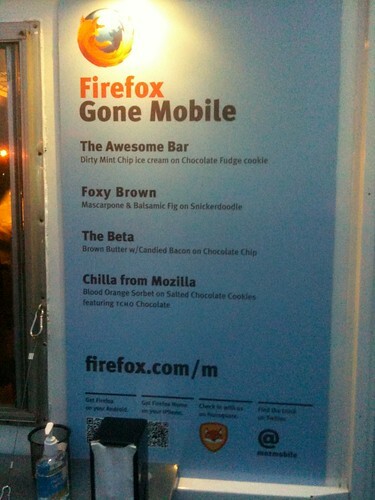 Not only did you get a nice foursquare badge for checking in at their ice cream truck (and did I mention, get ICE CREAM?) 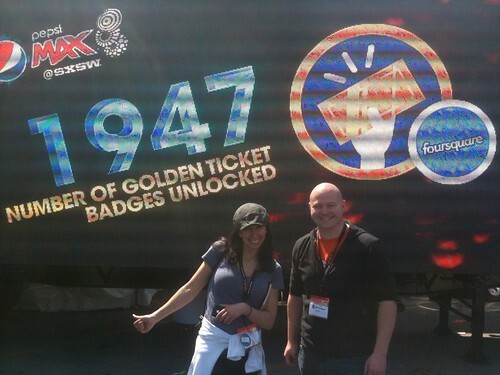 they also gave away these cool analog badges to boot! 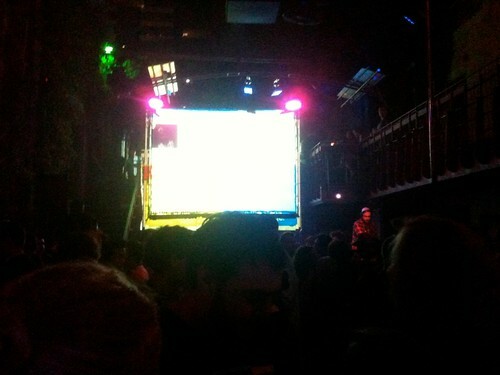 The Awesome Bar. Would you order anything else? 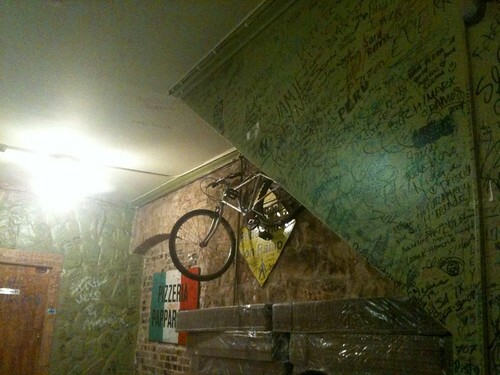 A hole in the wall pizza place off 6th street in Austin. The inside is sharpified. Can’t recommended the food but the sharpie-fied walls are a spectacle. 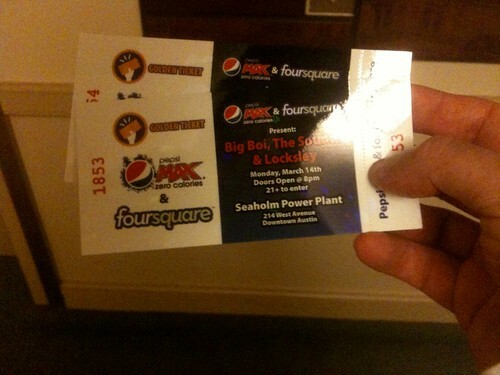 foursquare was randomly giving out “golden ticket” badges that would get people into a special concert they were throwing with Pepsi. Here golden ticket holders CMajor and Chris Thompson pose with the sign. iPads were EVERYWHERE. It didn’t hurt that Apple opened a special popup store for the event to sell the iPad 2. 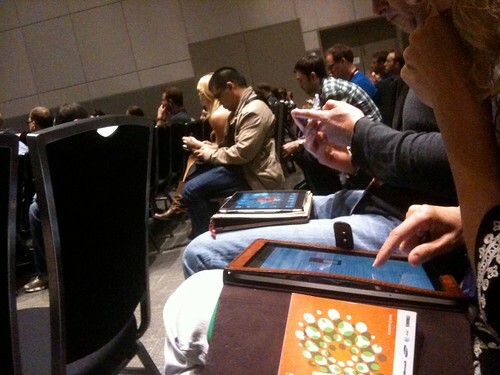 Forget your laptop at events like these, touch devices are the only way to make it happen at SXSW. 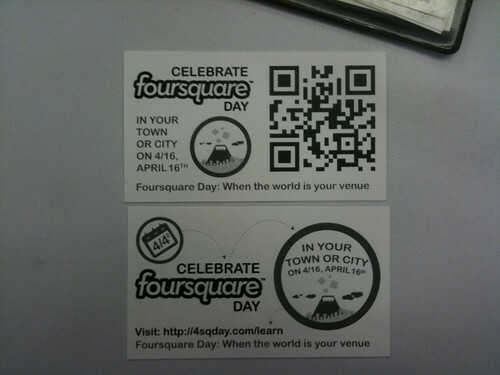 These are what the golden tickets looked like that foursquare was giving away to golden ticket badge holders. 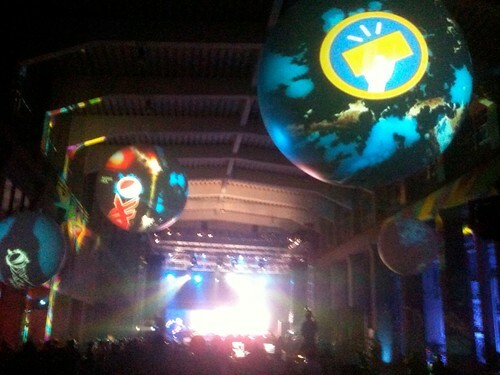 This is the venue for the foursquare golden ticket badge holders concert. Unusual and cool! 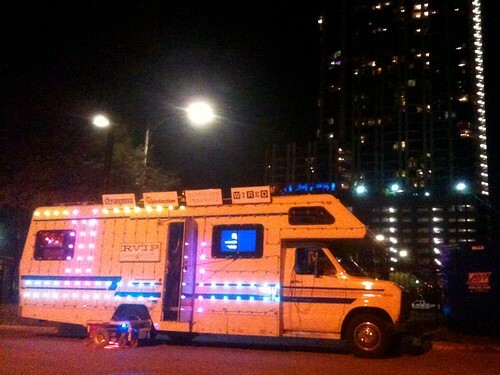 It’s a roving RV where you can sing karaoke (and earn a foursquare badge). It was parked outside of the golden ticket concert entrance. If I wasn’t about to go into the concert I would have taken it for a ride! This was on the inside floor of the power plant. 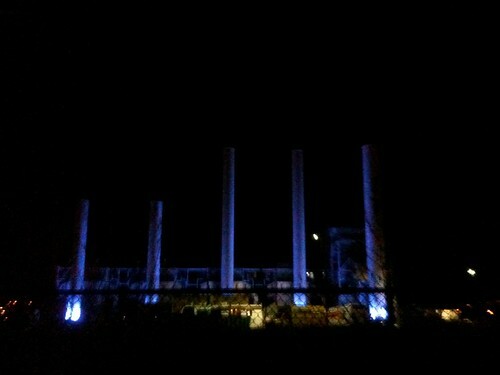 The power plant is inactive and used as a music venue in Austin. Very cool! 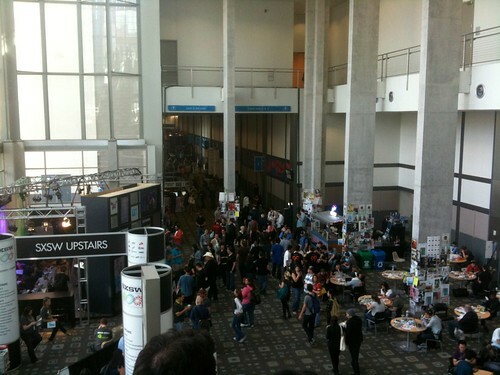 Outside the convention center were two of the characters from Xtranormal: the animated video service AdAge said would redefine web creativity and economics. I met members of their team and posed for a picture with them. 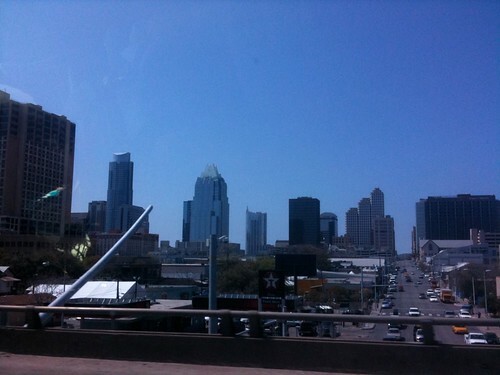 Downtown Austin as viewed from the taxi on the way to the airport. 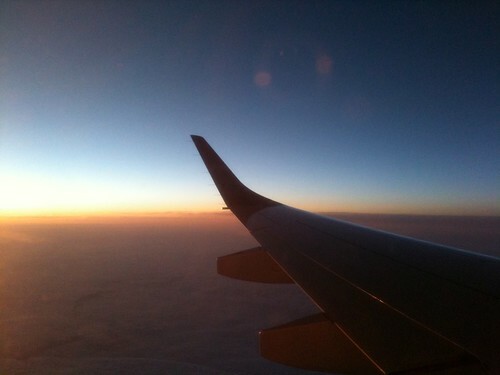 Flying east, watching the sunset over the wing aboard a JetBlue A320. Sarah Wallace had the seat next to mine and made the 4.5 hour flight feel like 5 minutes. 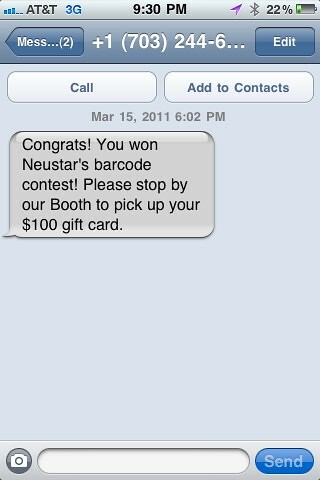 As soon as I turn my phone on after landing I got this text message alerting me that I’d won a giftcard that I entered to win at the tradeshow earlier in the day. Doh! 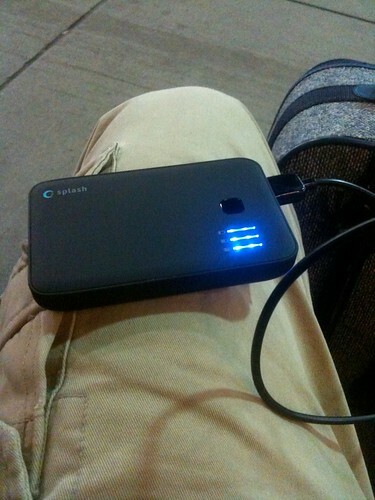 By far the most valuable tech device at SXSW, aside from my iPhone, was the Splash Intense battery pack. Here I am, already missing Austin and SXSW, making good use of the battery pack while waiting for the C&J to take me back to New Hampshire. 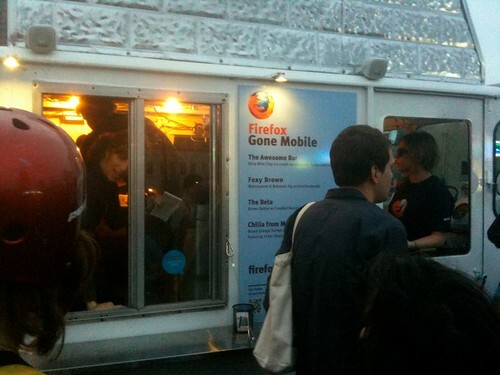 I hope you enjoyed my photo blog of SXSW 2011. Did you take pictures or blog about the event too? I’d love to see what you shared, so please post a link in the comments!